Do you need to replace your rusted or broken brake line retaining clips? 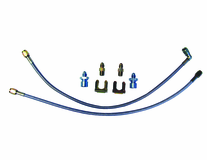 These Allstar Performance brake line retaining clips provide an easy and secure way to mount your brake lines. Brake Line Clip Set, 11 Pcs. Brake Line - Clip Set, 11 Pcs. Brake Clip Set, 11 Pcs.